Little red riding hood is back with a vengeance. In the relatively short time he has come to identify himself as Azrael, Jean Paul Valley has sought to come to grips with "The System," post-hypnotic suggestions implanted by the order of St.Dumas to transform him into its assassin and avenging angel. As the substitute Batman, Jean-Paul succeeded where Bruce Wayne failed, stopping the Venom-maddened Bane and a host of Arkham escapees until "The System" and his own personal psychoses drove him over the edge and the Mantle of the Bat was reclaimed by Wayne. Much later, with Batman's help, Azrael embarked on a journey to uncover his true origins, a quest that paired him with the alcoholic ex-psychiatrist Brian Bryan and the renegade Sister Lilhy of the Order of St.Dumas. 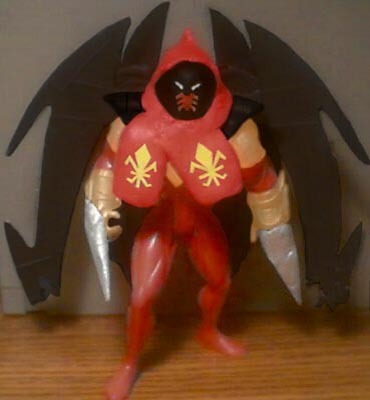 I made this several years ago out of a Legends of Batman "Knightfall Batman," which was basically AzBats in his final red costume. After my dog chewed on his plastc cape, I decided to fiddle around and see what I could come up with. Since the figure was already basically red and gold, very little painting was involved. The swords and hood are Sculpey, which was fairly easy to work, but the cape was kinda tricky. Since AzBats' cape was less substantial than Azrael's, I needed to add some bulk. I took the cape from the original Mr. Sinister figure (getting an idea of how old this really is? ), I carved out a notch so the two would fit together. A few quick coats of paint (well, not quick - I was still using enamel at the time) later I had the look I wanted, being very careful with the yellow insignia on the collars. Azrael stands about five inches tall, and has the Big Five in articulation. Did you like the whole "Broken Bat" storyline? Tell us on our message board, the Loafing Lounge.